Embark upon an entertaining 1.5-hour evening excursion through the shadowy streets and lanes of Key West. You will hear the stories of those who reportedly encountered dark spirits in this tropical paradise. Clothed in black Victorian-era formal wear, your guide will introduce you to some of Key West's most bizarre tales and malevolent locations. Hear the bone-chilling tales and eerie legends of lost love, settled scores and tragic endings associated with the southernmost city's sinister and bizarre past. One of these strange stories is the alleged antics of a century-old doll named Robert, which served as the inspiration for Chucky in the "Child's Play" movies. Decked out in a white sailor's uniform, the charming doll is accused of trying to kill his owner and another child who lived in the house. 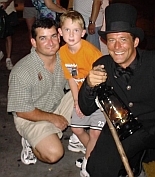 Featured on numerous television shows, the lantern-led tour was created in 1996 by David Sloan, author of the book "Ghosts of Key West." See why this original ghost tour is still the most popular expedition for paranormal occurrences on Bone Island. The search for unexplained activity begins when the sun goes down. Make a reservation today for an eTicket to Key West's number one walking tour for over 15 years. Tours depart nightly, rain or shine. Current departure time is 8:30pm. Starting November 2nd-tour departure at 8:00pm. New Location at 430 Greene St. (Between Rumors Lounge and Capt Tony's). Please arrive 1/2 hour prior to tour. Duval St. and Greene St.
Children prices are 12 yrs. of age and under. Phone-In reservations are required at least 24 hours in advance as space is limited for this popular tour. Your eTicket will contain all details. Tickets purchased online can be used any day.